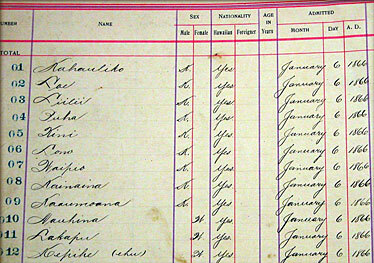 A Kingdom of Hawaii registry, above, lists Hansen's disease patients forcibly exiled to the remote peninsula of Kalaupapa on Molokai. The list shows the names of the first 12 people banished to Kalaupapa and the date: Jan. 6, 1866. They were admitted as patients. The 8,000 Hansen's disease patients who were exiled to Kalaupapa would be memorialized in a monument authorized yesterday by the U.S. House. The measure, which will go before the U.S. Senate, would "bring these people back to their rightful places in their family genealogy and history," said U.S. Rep. Mazie Hirono, author of the bill. There are marked graves for only 1,300 of those people who were quarantined because of fear of the disease also called leprosy, she told lawmakers from the House floor. The action was applauded by remaining patients, family and supporters, who are organized as Ka Ohana O Kalaupapa. Ohana members planned to testify today at the state Legislature in support of a bill that would fund the monument. The Senate Health Committee hearing will be at 1:15 p.m. in Conference Room 16. "I thought this is a piece of history, part of what happened in this state that we shouldn't forget," said Senate President Colleen Hanabusa, who introduced the bill. "I believe we should do this while some patients are still here and can give their opinions." Kuulei Bell, president of the ohana group, said, "It would be a fitting honor and tribute to all of us to have the monument before the last patient dies." 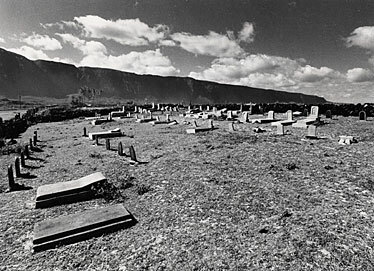 Kuulei is one of the former patients who chose to stay at the remote Molokai village after the state lifted the quarantine in 1969. Like others in the aging population, she now lives on Oahu because she requires medical care beyond that available at the state Department of Health clinic and care home at Kalaupapa. Only 28 of those "historical patients" are still alive. "I want this monument to also be a tribute to the suffering and sacrifices that our families had to endure," said Bell. "My mother's father and her husband, my father, were exiled. She was left behind with sole responsibility of five children. I, too, was taken away from my mother." Bell, who contracted the disease when she was 6, was raised in Oahu facilities before choosing to move to Kalaupapa in 1956. She retired as postmistress there. U.S. Rep. Bob Bishop, R-Utah, spoke in support of Hirono's bill, as did Eni Faleomavaega, American Samoa's congressional delegate. U.S. Sen. Daniel Akaka said a memorial "will enable our nation to honor the people of Kalaupapa as a living American legacy of human spirit and dignity." He authored a companion bill. No date has been set for Senate consideration. "It's important that something be done while we're still here," said Clarence "Boogie" Kahilihiwa, who has worked in heavy-labor jobs since he moved to Kalaupapa in 1959. It's been the topic of committees and meetings for years, he said, and residents have long backed "something to remember the people who suffered long before. It should be remembered like we remember World War II and Vietnam war."